"I received a letter telling me to hold myself in readiness to be called up at any minute"
Third of seven children, Beatrice Tanner was born on the 3 April 1879 to Samuel and Janette Tanner at Weston in Bath, Somerset. Her father was a coal merchant and a Justice of the Peace. 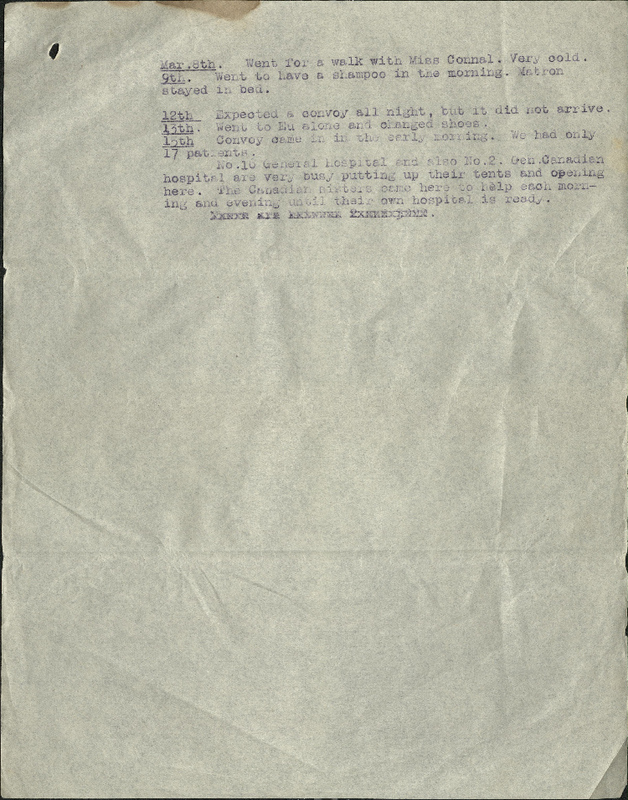 Tanner trained as a nurse and, as an army reservist, was called up at the outbreak of war. Her wartime was spent in France, and she nursed in several hospitals, ambulance trains and hospital barges. For some months in 1914 and 1916 she kept a diary. 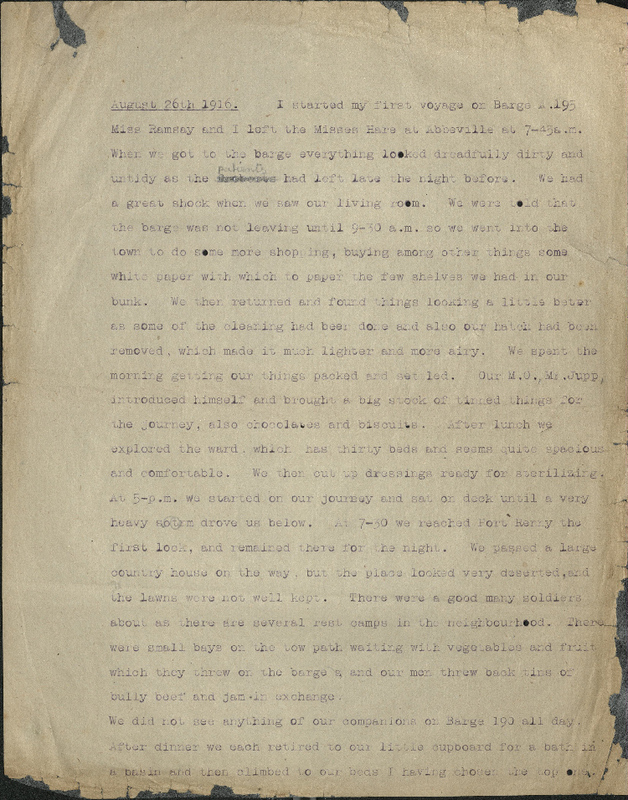 Her diary is a wonderful mixture of snippets of daily life and information about the War. Image: Beatrice Tanner (right) in uniform. Taken from Doors of Possibility: The Life of Dame Emmeline Tanner, 1876-1955. From 1899 to 1902, Tanner was a probationer and staff nurse at the Clinical Hospital in Manchester. She then moved to London to continue her training, working as a staff nurse at St Mary's hospital, Paddington. In 1906 she went to the nearby General Lying-In hospital for her midwifery training. A couple of years later she applied to join the Queen Alexandra’s Imperial Military Nursing Service (Reserve). 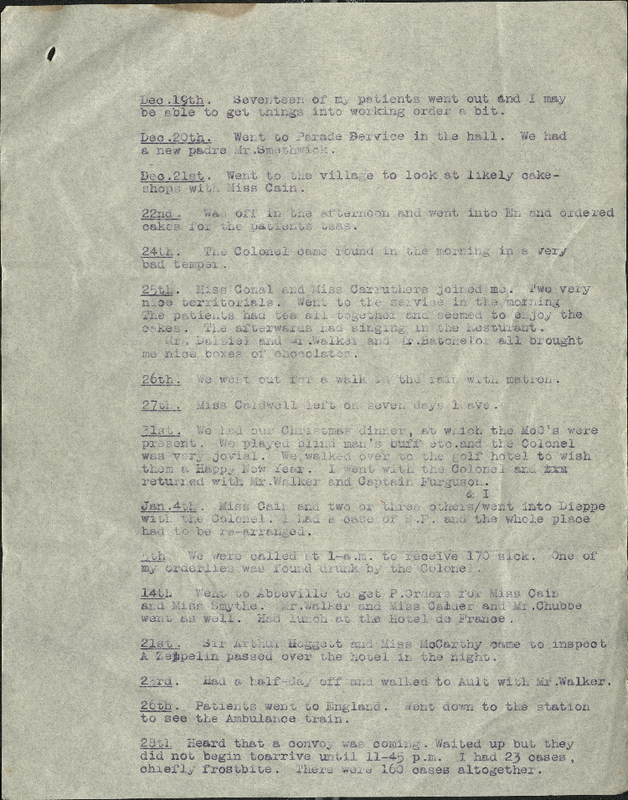 On 4 August 1914, the day war broke out, she was contacted to ‘hold herself in readiness to be called up at any minute’. She spent the ‘next three days getting my kit together’ with her two sisters Eva and Emmie. By the end of the month she was nursing behind the front lines near Rouen, France. She makes no mention of her emotions at the outbreak of war, only recording the practical steps she took to make herself ready. Background image: Britain at War with Germany newspaper headline. Image © Trinity Mirror. Image created courtesy of THE BRITISH LIBRARY BOARD. Getting to France was not smooth sailing. It was the beginning of Tanner’s chaotic experience of war. She went with 43 other nurses to Preston, where there was not enough accommodation. 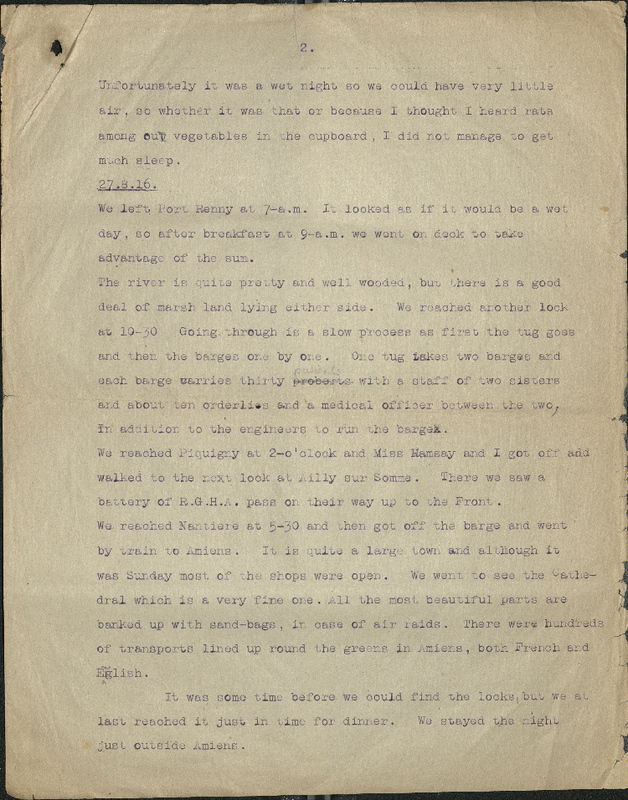 She writes there was further difficulty as the ‘holidays were on and all the shops were shut and the whole town full of military.’ It must have been a rapid change from peacetime just a week before. The mobilised army were attempting to make their way to the front too. Upon reaching Southampton there were further delays, as there was not a boat ready with ‘accommodation for ladies’. 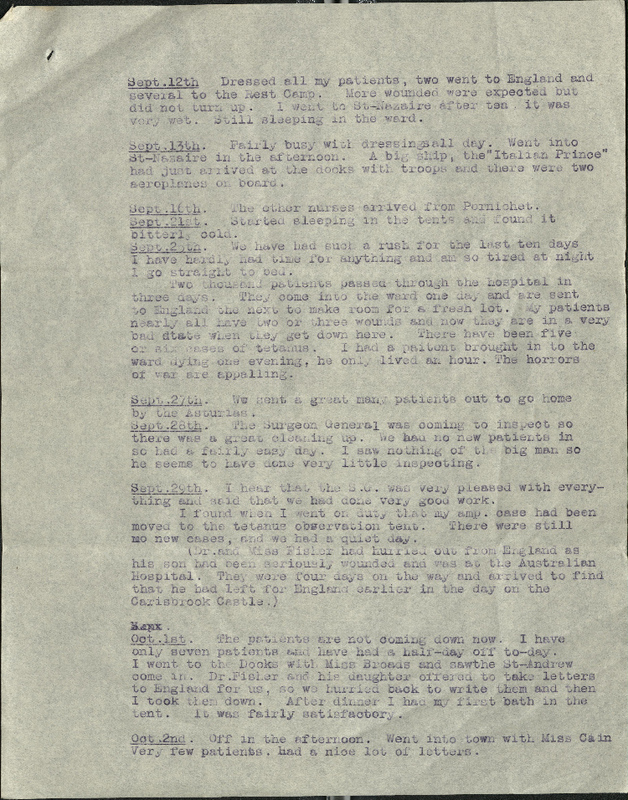 When Tanner and her fellow nurses finally left for France it was on a troop ship they shared with two cavalry regiments, the 11th Hussars and the 5th Dragoon Guards, and over 1,000 horses. She does not complain about the conditions on board, except about the lack of food other than biscuits, so it seems sharing the ship with hundreds of horses was not as bad as could be expected. On 16 August Tanner reached France. When Tanner and her colleagues arrived in Rouen there was not much to do. 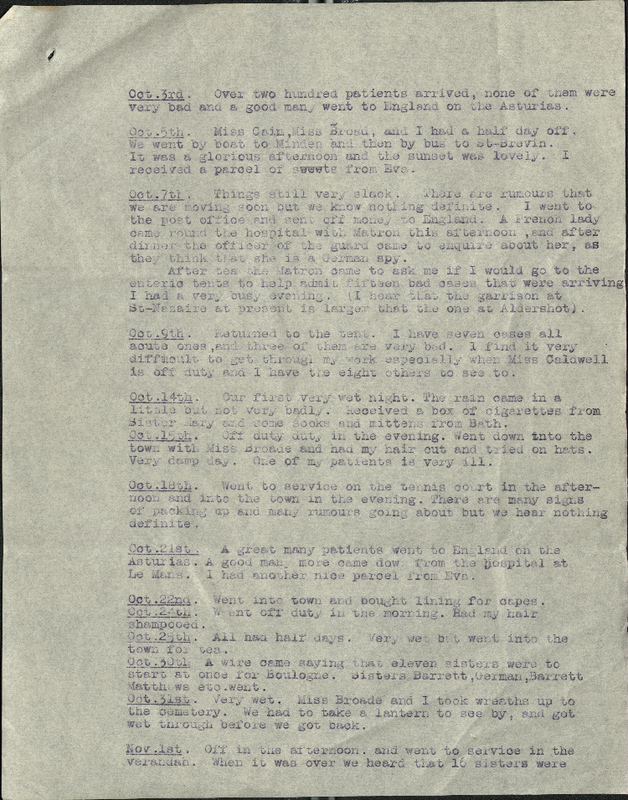 Arriving in France so early into the war, a great deal of time was spent in arranging and rearranging to prepare for the casualties. The nurses also managed to squeeze in some sightseeing. After a few days Tanner received orders that she was to head to a nearby monastery that was to be used to nurse officers. The Mother Superior of the convent, Tanner notes, was German, and had nephews fighting on both sides of the war. This was by no means a unique position; the war saw many people have their families divided. Although the convent met with Tanner's ideals of cleanliness, she was quick to feel stifled in the enclosed space. The sisters had no connection to the outside world, and were anxious to please their visitors. Tanner makes no mention of any officers in the convent at this time. She appears to find the lack of work combined with the sisters closed life-style very trying. Her billeted partner, Miss Hill, was not to her liking either ‘Miss Hill is a very trying person to be shut up with […] she talks continually and there is never anything in what she has said.’ As soon as she could, Tanner escaped for the day to see her friend and fellow nurse Miss Broade, who had come across from England with her. With no patients to help in the monastery Tanner continually travelled to the nearby No. 3 General Hospital. 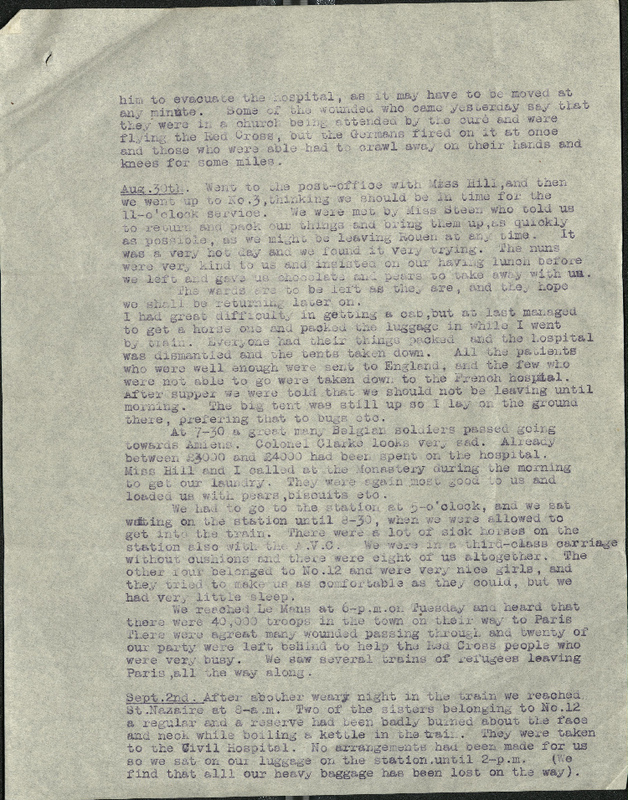 Here she received bits of news from the front, ‘the West Kent have been almost wiped out whilst bathing’ and ‘the hospital at Amiens has been sent back and that the nurses have had to leave without their things’. 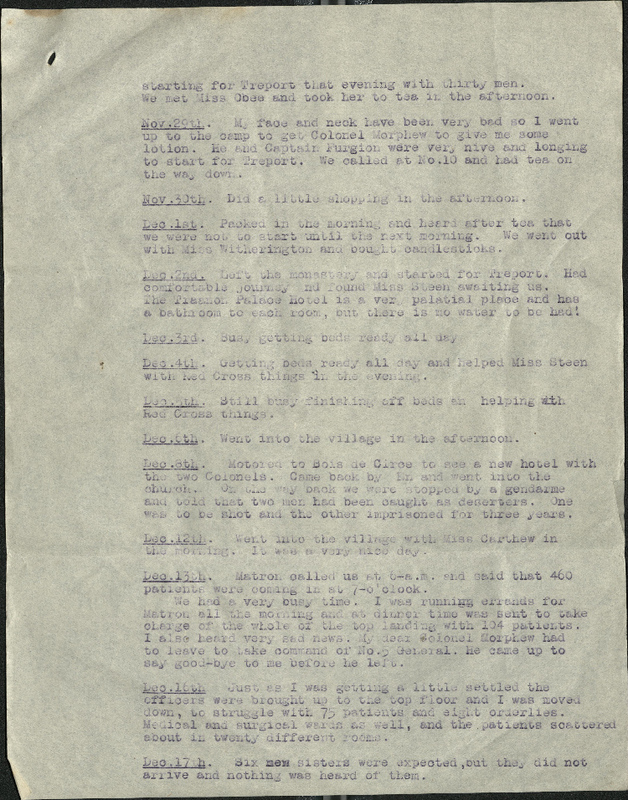 These small snatches of information and rumour are perforated throughout Tanner’s wartime experience. She was constantly uncertain of what was happening in the wider war, and of what her next order would be. Without anyone to nurse this anxiety grew. Tanner disliked her inactivity at the monastery when the hospitals around her were rapidly filling up with the retreating wounded. On 30 August, not two weeks since they arrived in Rouen, the hospital had to retreat to St. Nazaire. The empty wards were left in the hope they would be able to return. Retreat was a chaotic affair. From her packed carriage on a train, Tanner witnessed the journeys different people were undertaking. Several trains filled with refugees fleeing from Paris, the 40,000 troops heading into the city and the Army Veterinary Corps treating sick horses. Two nurses were badly burned on the train whilst attempting to make tea and had to be hospitalised themselves. They were destined for St. Nazaire, where Tanner was to be truly tested in treating wartime casualties. Tanner was held in limbo for the first few days in St Nazaire. She and her companions were able to have tea, explore the surrounding area and go swimming in the sea, but they knew they had to be ready at all times for a sudden influx of patients. On the 11th of September this long suspense ended and all eighteen of Tanner’s beds filled up. Most likely these were men from the Battle of Marne, the men she had seen a few days previously heading to Paris. From St. Nazaire those casualties who were fit enough could be evacuated by sea to hospitals in Britain. Tanner mentions several times the arrival of the ‘Asturias’ to take patients home. This is the same ship another one of our nurses, Nellie Carter, would work on two years later. A great many patients went to England on the Asturias. Nellie Carter on the deck of the Asturias in 1916, courtesy of Peter Carter and Family. As Tanner’s life in France swung between extremes, she attempted to keep some normality. 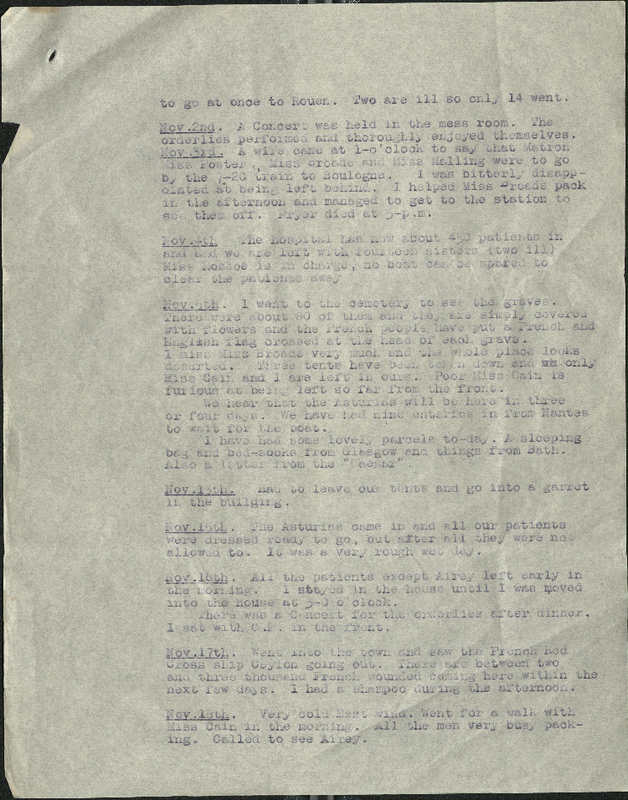 A lot of the focus in her diaries revolves around letters and parcels from home - ‘I received a parcel of sweets from Eva’ (3 October) and on Bonfire Night ‘some lovely parcels today. A sleeping bag and bed-socks’. These thoughtful presents were clearly very much appreciated, grateful mentions of them smatter the pages of her diary. Tanner filled her hours away from the hospital with ‘normal’ activity, often with her fellow nurses. She appears to have been particularly close to Miss Broade, they go out together on multiple occasions sightseeing, shopping and for tea. However, these excursions never completely isolated them from the war. After a day motoring ‘to see a new hotel with the Colonels’ a French policeman told them ‘two men had been caught as deserters. One was to be shot and the other imprisoned for three years’. Distraction from these horrible events was important. The nurses and orderlies spent time entertaining the patients. On the 2 November ‘a concert was held in the mess room. 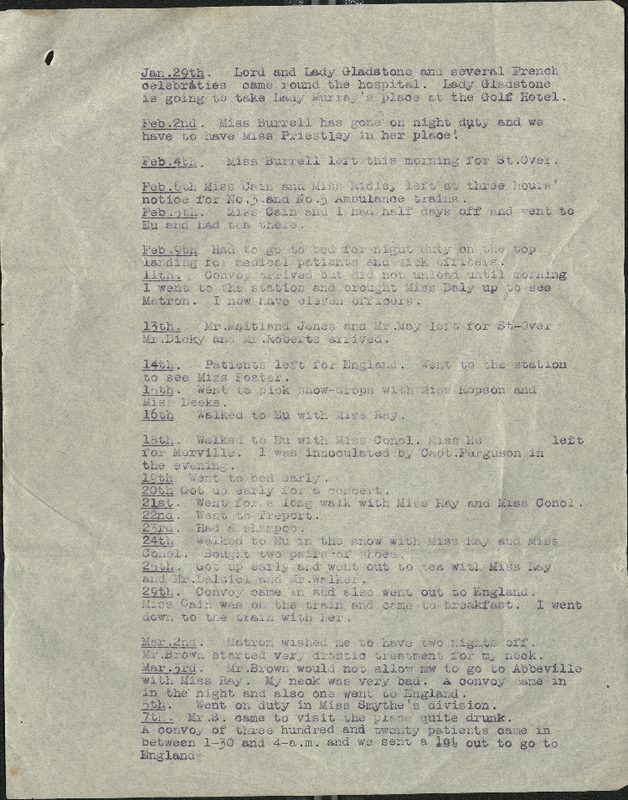 The orderlies performed and thoroughly enjoyed themselves.’ Tanner neglects to mention anything else in her diary entry for that day, so it seems they did a good job of distracting her too. At Christmas Tanner and Miss Cain made the effort to order cakes for the patients, and there was ‘singing in the restaurant.’ The staff had a belated Christmas dinner on New Year’s Eve and ‘played blind man’s bluff etc’. Towards the end of 1914 the St. Nazaire hospital’s resources began to be stretched. In quick succession many sisters were given orders to leave for other hospitals. Sixteen had to go to Rouen, and then a further three to Boulogne. One of those leaving was Tanner’s friend Miss Broade, who had been with her since they left England. 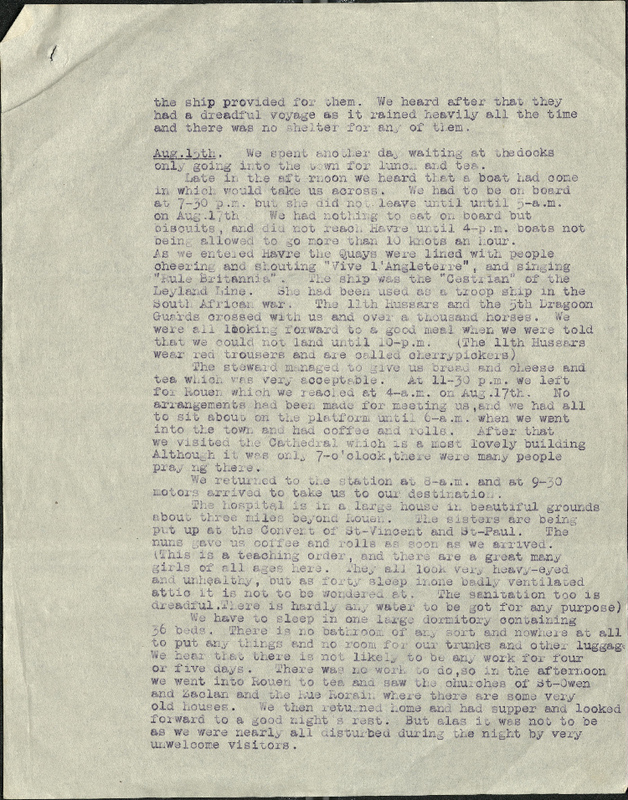 In possibly the most emotional passage in her diary, Tanner writes ‘I was bitterly disappointed at being left behind […] I miss Miss Broade very much’. A fellow abandonee was emotional at the situation too, but for different reasons ‘Miss Cain is furious at being left so far from the front’. The shear amount of work they had did not leave them long to mourn their change in circumstance, and by the end of November they too were moved back to Rouen. 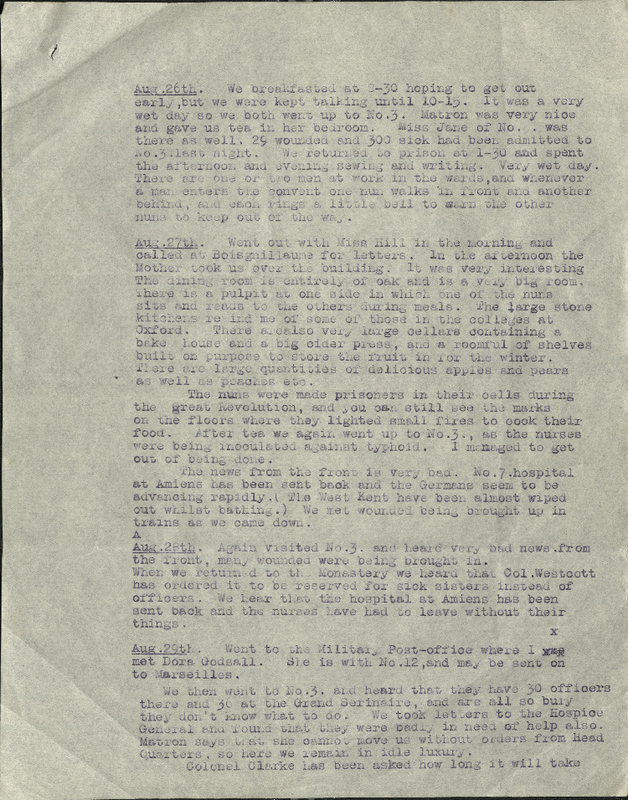 Tanner’s diary ends in March 1915, and is picked up over a year later in August 1916. From her war record we know that in this intervening period she was nursing at No. 4 and No. 26 General Hospitals. When her diary starts again she is about to embark on her first voyage on Barge A. 195. A few years into the war barges became repurposed as hospitals and as methods of troop evacuation. Barges were painted white on the inside, with a red cross on the outside to indicate they were a hospital. Despite this they still had to turn the lights out at night in case of bombers, with nurses making the rounds with a torch. Arriving on the barge that was to be her home for the next few months, Tanner was initially unimpressed ‘everything looked dreadfully dirty and untidy’ but she concedes that the ward of thirty beds ‘seems quite spacious and comfortable’. Using barges was a slow means of transport, but it meant a smoother ride for the patients in the beds. The nurses all slept in the barge too, but its motion would have not disturbed Tanner much in her top bunk bed. Her first night on the barge was instead disturbed because ‘I thought I heard rats’. The barges did not have their own engines, and were instead pulled along by a tug boat. Tanner very helpfully explains how it works ‘One tug takes two barges and each barge carries thirty patients with staff of two sisters and about ten orderlies and a medical officer between the two, in addition to the engineers’. Two days into Tanner’s first journey they were already delayed as ‘one of the engineers on the tug had been bitten by a wasp on the forehead’. Unfortunately, in her time on the barge Tanner was to witness far worse injuries than wasp stings. She was travelling along the river Somme collecting and caring for the casualties of the battle of the Somme. The battle of the Somme was one of the bloodiest in the First World War. Over a million people are estimated to have been killed in the five month campaign. 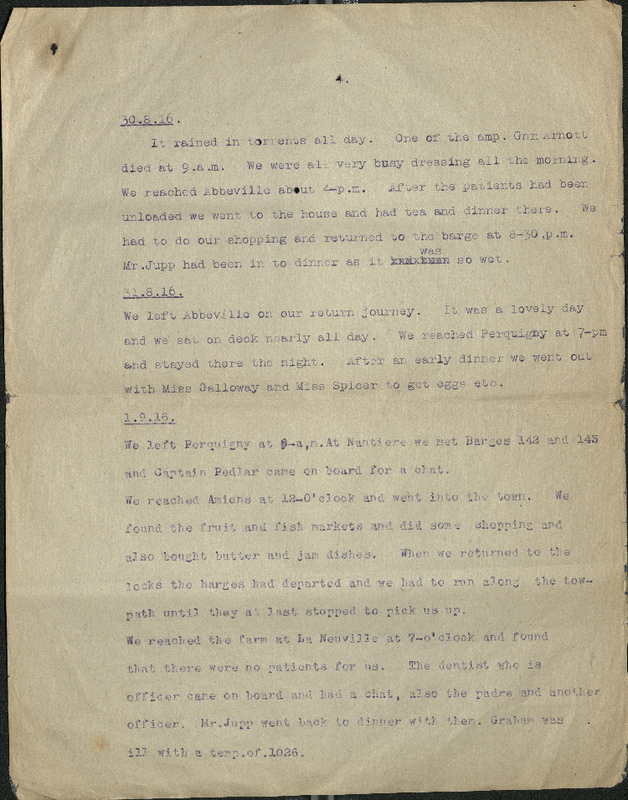 A particularly grim entry from 3 September reads ‘we had several bad lung and abd. [abdomen] cases, three amps. [amputations] and one poor boy had both eyes shot out.’ The next day she visited a hospital and saw ‘one of the officers, a shell shock who could not speak or open his eyes […] they say he cannot possibly get better’. Abbeville, where Tanner departs from on her first barge trip. She returned here many times, returning on the barge for the last time in October 1916. Tanner first arrives in Amiens on the 27 August 1916. 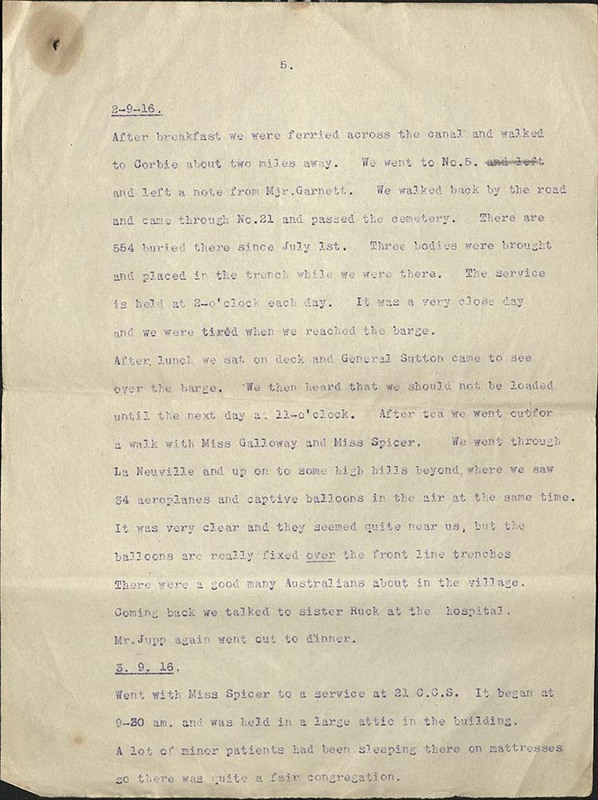 On a later visit a German aeroplane dropped bombs all around the area. 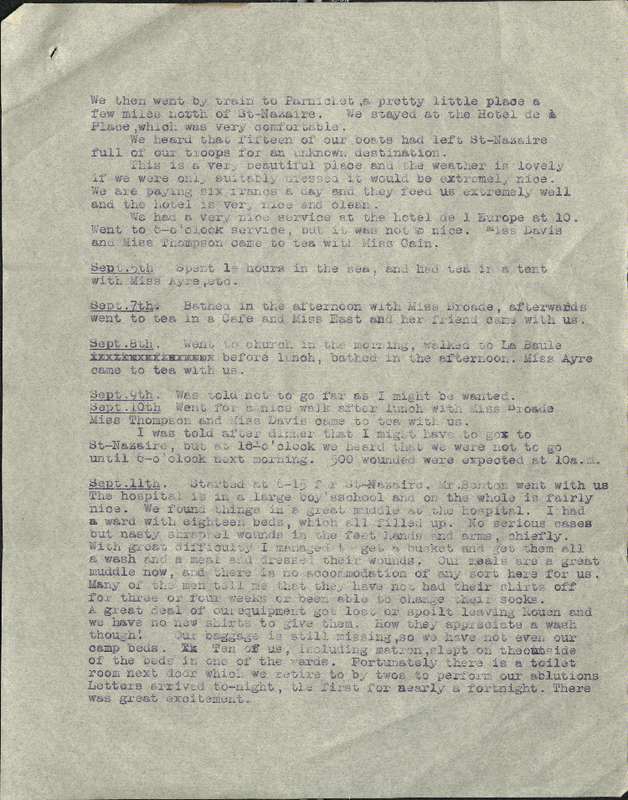 Tanner spends the night in Corbie on 28 August 1916, a village which seemed to be "full of troops both French and English". Battlefield Maps: Western Front. Courtesy of Firstworldwar.com. 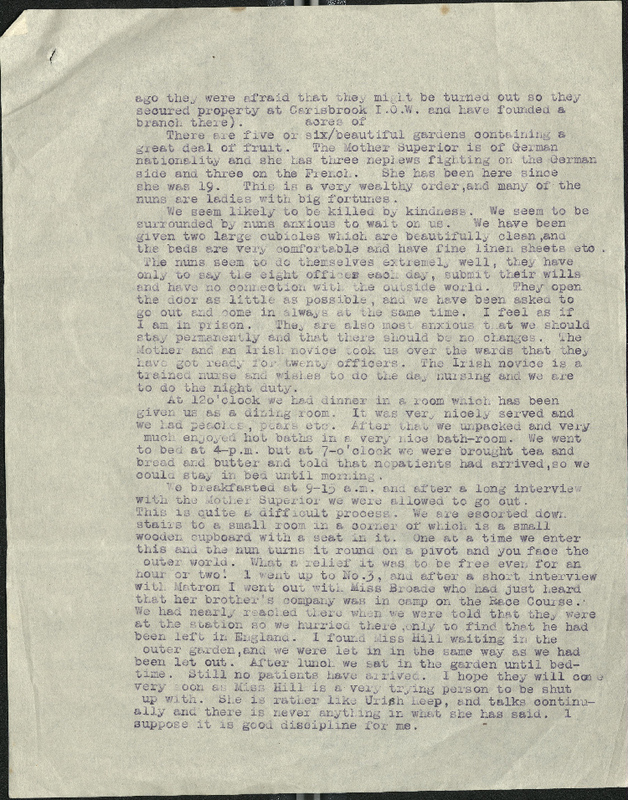 It is amazing that two years into the war, and so close to the front line, she manages to maintain her enthusiasm in her surroundings, and that the wartime conditions all around her did not diminish her interest. What is striking is how Tanner documents the events of the battle of the Somme. She does not focus on how it affects her, but just states the facts of what she witnesses. The diary is not solely filled with the distressing sights Tanner witnesses, but also her constant interest in food. At the end of her grim walk on the 8 September her only personal response is to mention that she was ‘tired and hungry’. When people show kindness Tanner is grateful, and records numerous occasions when people bring the nurses tea and dinner. On her passage to France in 1914 there was ‘nothing on board but biscuits’. She appears to have learnt from her mistake and spent the rest of the war ensuring she had enough to eat. She particularly mentions the fresh food she has, and had perhaps grown weary of tinned army food. One particularly triumphant day saw ‘small boys on the two paths waiting with vegetables and fruit which they threw on the barges and our men threw back tins of bully beef and jam in exchange’. A few weeks later she was less successful; ‘We went to look for eggs and milk before dinner, but had great difficulty in getting any. The cows are not milked until 8-o’clock’. Perhaps her continuous pursuit of food was a means for her to maintain some normality. Many of the foods she mentions, such as jams and butter, speak of comfort. She makes no mention of how this affected her or those on the barge with her. It’s incredible that after events such as this Tanner and her companions would then spend a day walking through the local countryside. As they travel on to Amiens, again they are close to conflict. This time they appear to have become a target. ‘A German aeroplane has been hovering about all day, but we have not been able to see it. 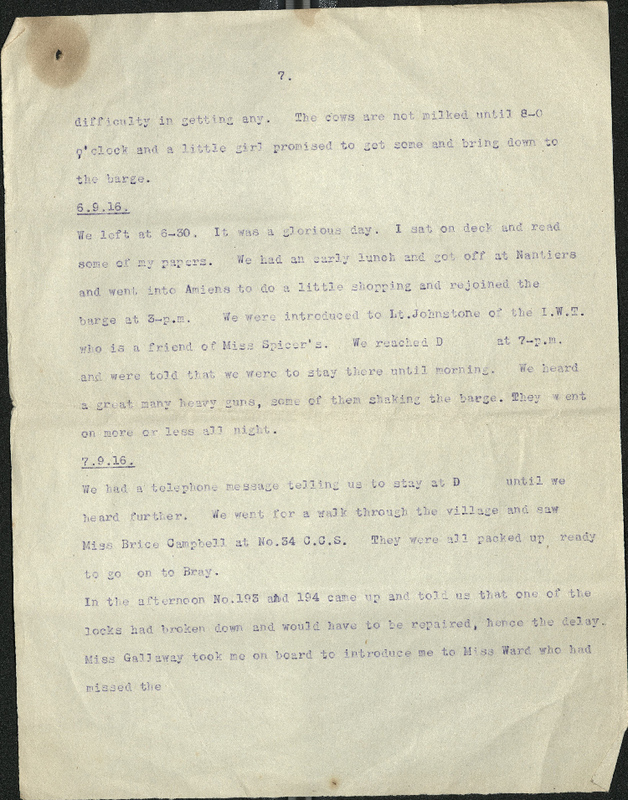 We could see the shrapnel bursting all round.’ Again just a few days later she is out in town ‘to do some marketing’, stoically carrying on whilst the war continued around her. We heard a great many heavy guns, some of them shaking the barge. They went on more or less all night. We do not know what happened to Tanner for the rest of the war. It certainly seems as if she carried on nursing throughout. After the war she received the 1914 star, British War medal and the Victory medal. In addition, she was awarded the Royal Red Cross 1st class in the New Year honours of 1919. Tanner carried on nursing after the war and remained in the Reserve. In 1920 she wrote to the War Office asking about attending the unveiling of the Cenotaph in London. We do not know if they granted her permission to do so. She continued in private nursing as she had been prior to the outbreak of the war. Her service records show she moved to Battle some time in 1931, still as a private nurse. Later in life she started to focus on farming her property. This rendered her no longer eligible to be a Reservist. At the outbreak of the Second World War she offered her services again but was not accepted as she was over 50. The letter suggests she could try the local Red Cross. In the 1950s and 60s she spent a lot of her time on cruises to Africa. Clearly her time on Barge A. 195 had not put her off waterborne transport. Tanner died on 26 February 1966 in Wiltshire. She left her money to her sister, Winifred Nettie Gauntlett, and to her nephew.